This past weekend my older sister, her fiance and my parents were in town to take care of some wedding tasks. The wedding is taking place in downtown Minneapolis in October, so they get to travel here to get everything planned. I LOVE it because that means I don’t have to travel and I still get to see my family more this year. Win, win WIN! Anyway, to run errands such as choosing the groom’s tuxedo, taking a look at the chapel and wedding photo opportunities (and grabbing a mid afternoon beer), I thought it would be a great time to wear (and show off) my new floral blazer. I paired it with plain white t-shirt (borrowed from my boyfriend), my teal skinny jeans and mint pumps. With some jewelry accents, like my favorite Lia Sophia bracelets and this gorgeous mint chain link bracelet from Sira & Mara, everything felt just right! Do you own a floral blazer? How would you style it? I am definitely trying to figure out new ways to wear it, but I think it will be versatile piece. You look great Rachel and I love that floral blazer. Great Spring look. I love the mint heels and bracelet! And your just fab bag is…just fab lol. Did you watch the series about just fab on style network? Addictive! Love those green pants! So cute! i have been searching for the perfect floral blazer…i haven’t found one yet. this one is gorgeous!! how fun to plan a wedding and see your family! Such a pretty blazer! I don’t have a floral blazer, but I’d love one. I like how you styled this one – I bet it would look cute with dark skinny jeans too! Adorable floral blazer. Glad you had such a nice time with your family! This outfit is all sorts of amazing…can I borrow it, please and thank you! I just love this whole look Rachel! 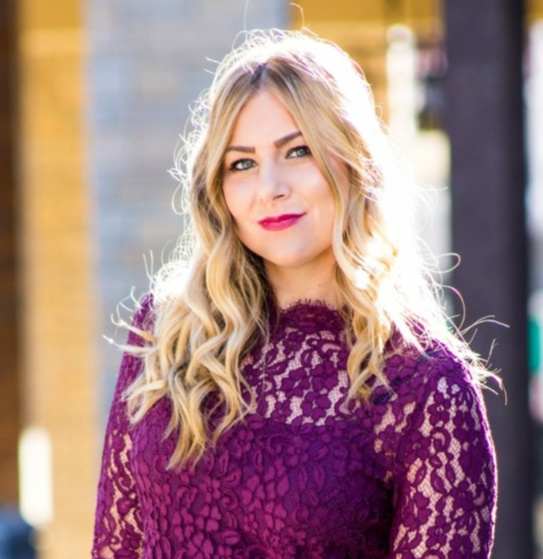 It’s so perfect for Spring…and I agree, I think that blazer will be super versatile! Great floral blazer, and love the color of the pants, and the pumps. Perfect for spring. Love the whole look, but that Blazer is fab! Happy Monday! LOL! It happens 🙂 AND please wear your striped blazer soon! I have a coral striped one and need more inspiration for this spring! You look fantastic! I love that blazer! I really want a floral blazer, but haven’t yet found one that I like in-person. the floral blazer looks lovely on you, such a nice spring look! What a pretty blazer! Looks fab with those teal pants! Stunning outfit! Love your blazer!! what a pretty outfit! it’s so spring! Hi dear, you have such fantastic style, love the pretty floral blazer and how well you styled it. Thank you for your kind compliments on the outfit post, we were thrilled to read it 🙂 Do you have GFC to follow you on? I love this floral blazer, you look stunning! 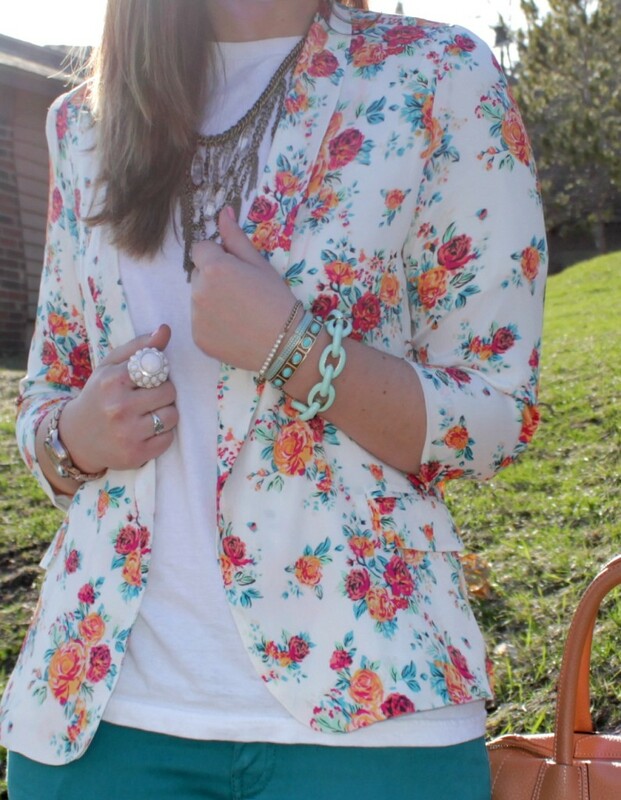 Love this floral blazer with those pants! You look gorgeous! Your outfit posts have been FABULOUS lately (I mean, they always were, but I’m loving this look!) I need to add a floral blazer to my wardrobe ASAP! Thanks Maya! I recently cleaned out a ton of stuff from my wardrobe and it has been making getting ready in the morning SO much easier. And I’m rediscovering things I’ve loved that were lost in that mess of a closet! 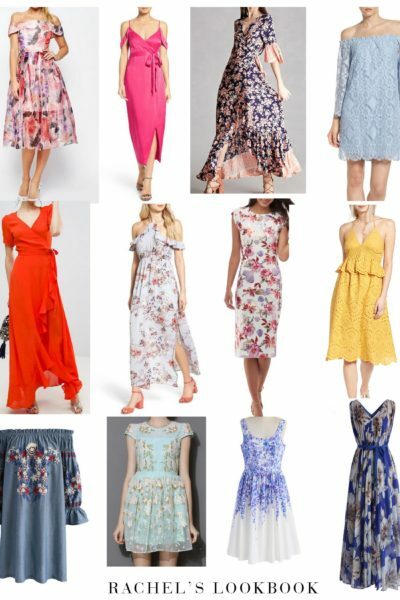 I´m really happy to own more than one floral balzer and I style it very similar to you, with a white or black top and with jeans or coloured pants. Your floral blazer is so pretty and looks amazing with those jeans! PERFECTION! Ahh, I love it! The mix of greens is fun too, but that blazer takes the cake. How exciting that your sister’s wedding is in your city! ohhh..such yummy colors! Love this blazer!! Want one now:-) Hope you are having a wonderful day! Such a chic and gorgeous look Rachel! 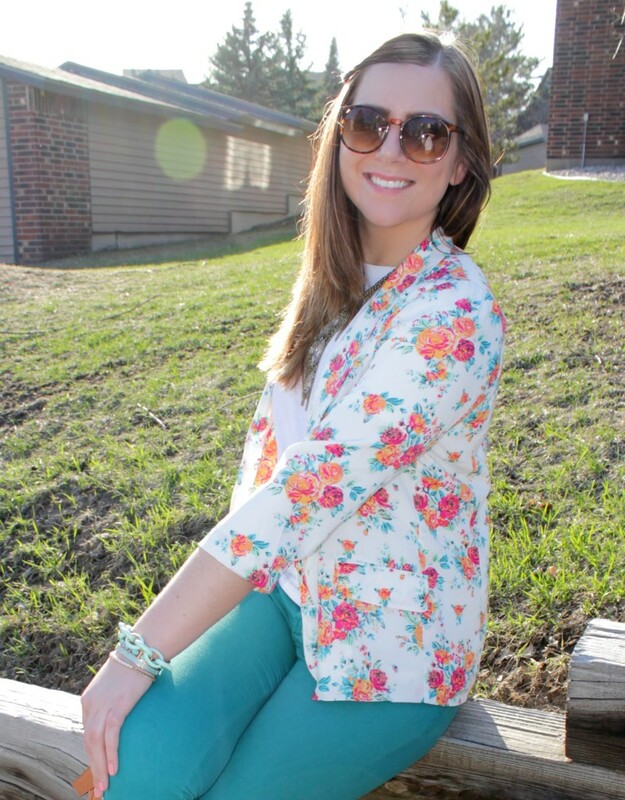 I love the floral blazer with the teal skinny jeans! P.S. I want that bag:)! This is a great blazer and thanks for showing how you style it! I just picked up a striped blazer and was wondering how to incorporate into my wardrobe. Have a great weekend! The floral print on your blazer is so springy and pretty! 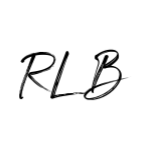 I like that it has a white background – makes it a little more versatile, I think 🙂 It sounds like you had a great day with your family, getting wedding preparations taken care of!! It takes so much planning – whew!